At one year of age, your child has higher and specific nutrition needs during a period of intense growth and development. 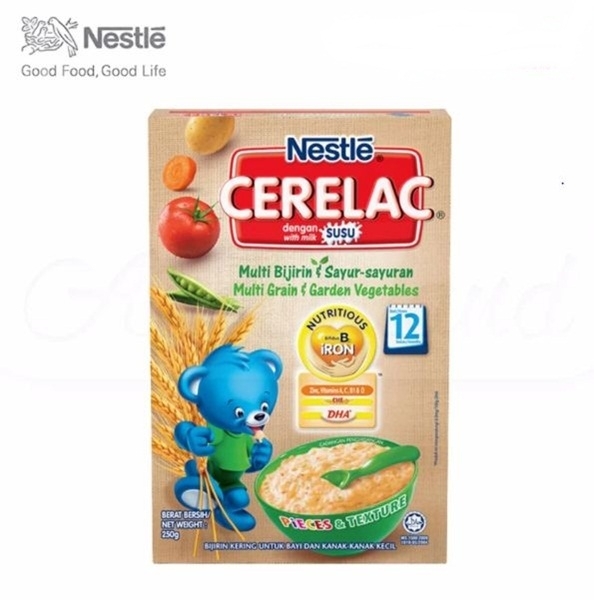 CERELAC Infant Cereal Multi Grain & Garden Vegetables is nutritionally tailored for your child and is packed with the right proportion of selected ingredients in dense volumes which are suitable for your child’s growing years. CERELAC meets 50% or more of your child’s required iron values to help him reach his full potential. Iron supports your child’s body and brain development. CERELAC Infant Cereal Multi Grain & Garden Vegetables uses a Nestlé® process breaking down the cereal into smaller units, thus making them easier to digest. With a variety of nutrients in a cereal that’s easy to digest, CERELAC Infant Cereal Multi Grain & Garden Vegetables will help your child bridge the nutrition gap at this important stage of growth. BIFIDUS BL beneficial bacteria help improve the beneficial bacteria in the gut, so your child's digestive system stays healthy! CERELAC uses a Nestlé® process breaking down the cereal into smaller units, thus making them easier to digest. CERELAC contains 25% more iron than previous formulation to help support your child's body and brain development. One serving of CERELAC meets more than 50% of your child’s daily required iron intake to help him reach his full potential. Iron supports your child’s body and brain development. Cereals (Wholegrain Oat, Wheat Flour), Skimmed Milk Powder (Cow's Milk), Mixed Vegetables Flakes (Tomatoes, Glucose Syrup, Maltodextrin, Corn Starch, Carrot Juice Concentrate, Sucrose, Peas, Potatoes, Sunflower Lecithin), Vegetable Oils (Palm Olein, Rapeseed Oil, Coconut Oil, Sunflower Oil), Corn Crunchies (Corn, Sucrose, Palm Olein, Malt Barley Extract, Salt, Calcium Carbonate, Gum Arabic, Tocopherols), Sugar, Minerals (Calcium Carbonate, Sodium Phosphate, Ferrous Fumarate, Zinc Sulphate), Salt, Vitamins (C, E, Niacin, Calcium Pantothenate, B1, A, B6, B2, Folic Acid, D3, Biotin, B12), Fish Oil Powder, Taurine, Vanillin, Bifidobacterium lactis Culture. Contains Permitted Flavouring. All additives are of plant or synthetic origin.